This river is one of California’s most famous golden river that is still worth visiting if you want to search for gold. It offers you not only a chance of discovering great gold nuggets but also wonderful sightseeing opportunities as it is in the heart of the Sierra Nevada. The Yuba River is one of the major tributaries of the Feather River that flows through the Sacramento Valley in California. In fact, the river contributes about 33% of the waters in the Feather River, another rich gold-bearing drainage. The primary stem of the river is around 40 miles long, and its headwaters are divided into three; North, Middle and South forks; the conjunction of the previous two is viewed as the start of the Yuba River. The name of the river is derived from a Maidu town, spelled in rightly s as Yubu and was first connected to the river in 1844. Some claim the name is a variation of Spanish uba or uva, alluding to grapes discovered growing along the banks of the river in the early days of Spanish exploration in the region. 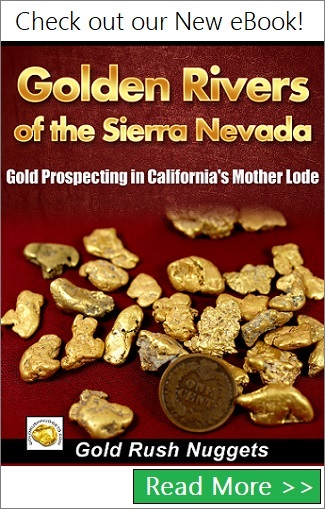 The history of gold mining in the Yuba River dates back to the gold rush period in California. The first European settled along the banks of this river in the late 1840s with the aim of mining for placer gold in the river. The first gold miners on the Yuba panned for gold in streambeds in the valley. They used large long tom sluices, rocker boxes, pans, and ground sluice operations to recover the gold from the gravel of the river. For the first few years of mining this was these simple placer mining methods recovered huge amounts of gold, but within a span of about 10 years large-scale, mechanized gold mining replaced most of the individual gold prospectors. bucket line dredges recovered millions of ounces of gold from the river. Soon the mining organizations moved from the valley floor to the Sierra Nevada foothills, where mineworkers blasted the rocky slopes with high-pressure water jets by a process known as hydraulic mining. After the miners removed gold in long wooden conduits, they dumped the rocks once more into the mountain valleys. The river waters then carried the surge of dregs—called slickens—down to the Sacramento Valley. The mine waste conveyed by the hydraulic mining operations along the Yuba River wound up raising the riverbed by up to 100 feet in some areas, bringing on surges that covered homesteads east of the town of Marysville with rock, mud, and mercury and arsenic (repercussions of the mining process). Today you can pan for gold along the Yuba River in many different places, although much of the river is already claimed by other miners. Still, there are several locations where you can search for gold with a gold pan. One of the most important gold panning sites along the river is the South Yuba River State Park. Gold was first discovered at Rose’s bar on the south Yuba River in 1848 and still many gold panners have luck with their gold panning every day. If you are new to gold panning then you should attend the demonstration events staged every Saturday and Sunday in the summer at the camp to learn more about gold prospecting and panning. Other than gold prospecting, you may also enjoy swimming in the South Yuba River. In fact, the river is known for its wonderful swimming holes that have pristine waters and are surrounded by smooth granite rocks. If you have children then you will enjoy the Kneebone and the family beaches. You may also take to hiking and experience the amazing view of the souring hills and mountains. This is another great place that anyone interested in gold panning should visit. Located within the Tahoe National Forest is the Union Flat Campground which has a section of the river that has been designated for casual use and is open to prospecting. You can find it by driving roughly 6 miles east of Downieville along highway 49. In the past visitors have found decent amounts of gold here, including valuable gold nuggets. Other than panning for gold along the shores of the river you may also enjoy sightseeing, fishing along the river, hiking, biking and backpacking among other outdoor activities.